Docking is a challenge. Our home slip is a pain to get in and out of since it is a very small marina. We have a boat about 40 feet in front of us and about three feet next to us. The way the marina is designed we actually have to back out of it, something we don't recommend but there isn't enough room to turn around. 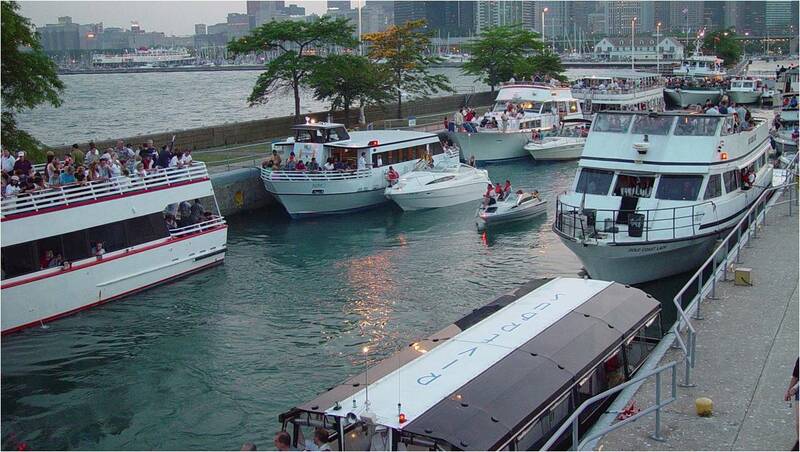 The river can be quite busy at times so it can be a challenge to dodge barges, tour boats, small pleasure craft, kayaks, and wave runners. Once on the water cruising is easy, Kevin steers the ship and Colette collects the lines and fenders for stowage. The reverse happens when we return, moving the boat in a zig zag backwards to fit in the slip. It cannot be stressed enough just how tight it is and the way Cygnet is designed doesn't allow much visibility of the water line. Kevin is on the flybridge guestimating the amount of space available and Colette is ready with a boat hook shouting out clearance in feet and inches to the dock and our neighbor's boat. Throw in a little wind, which whips around the 14 story building above the marina, and it can sometimes be a nail biter. Occasionally Kevin will have to place the starboard rub rail on the dock pole and rotate the boat around it to avoid a calamity. Not a good show of boatsmanship, but necessary. If you're thinking of a tight marina be careful where you dock and know that you may need help every time you depart or return. Locking is a challenge. Whenever we want to go to the lake we need to go through the Chicago Lock which is run 24/7/365 by the Army Corps of Engineers. Thank you guys and gals! The lock raises the level up from river to lake about 4-5 feet (remember the Chicago River flows backwards) and you have to hold on to ropes attached to the wall while inside. On most days the lock is busy but on summer weekends and holidays it is ridiculous. It can take 3-4 cycles to get through the lock the line is so long, and there really is no line, it's everyone for themselves and some people can be very aggressive. We've had shouting matches with speedboats and even other big boats who barge their way to the front after all of us have been patiently waiting for a couple hours. It also doesn't help that the lake side isn't a no wake zone and it's a very small area to queue up. Wind pushes Cygnet much more than the small boats on our leeward side and people yell at us thinking we are intentionally crowding them out. Sorry bro, it's windy today. Once in the lock it takes two people to hold the ropes and another person manning the engines to keep the boat from moving fore and aft. The water entering the chamber has huge power to push us and two people on ropes isn't enough to stop it. The engines must be used to keep us in our place on the wall. Plus the wind can also push us away from the wall if we're set up on the wrong side. If you have Locks where you plan to cruise you might want to try them on someone else's boat first to know what you're getting into. On the water can be a challenge. Recently we've had some trouble with our starboard engine. Some days it runs perfectly, others it doesn't. 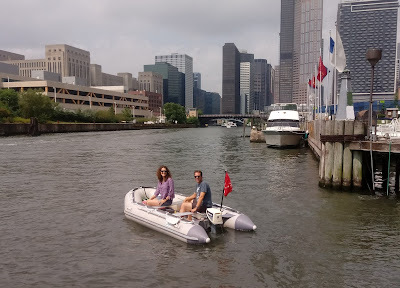 We seem to have an especially hard time keeping it around 1200 RPM while motoring through the Chicago River. It hunts from nearly stalling to 2000 RPM and won't sit right without constant attention. It also likes to stall out while docking, which is fun. You'd think after the massive amount of money we spent to tune the engines two years ago it should run right. Our new mechanic says the distributor needs to be replaced and we've been impatiently waiting for the last two months for him to actually DO the work. Mechanics in Chicago are in high demand in case you are looking for a lucrative career. Must be on crack and have no idea of responsibility to apply. But we've still been using Cygnet as we can. When we first noticed the problem this spring we went through the lock and tried to find a calmer spot for our friend Mike and Kevin to have a look while Colette did the start/stop thing. It's not fun in rough water to be doing engine maintenance down below, shouting start and stop commands through a fourth party in the Salon so Colette can hear us. Without help we'd be worse off, our two-way radios could help but they don't solve everything. The last couple outings the engine ran well, so maybe it was a fluke for a few trips. What has made this year very different than before is that we've been out on the water a lot, sometimes a few times a week although not aboard Cygnet. After years of thinking about it we decided we needed a little runabout for cruising the river. We researched, thought, and searched, and finally decided on a RIB. For those not aware a RIB is a Rigid Inflatable Boat. We had looked at some older fiberglass runabouts, something someone might buy to start out on a small lake, but we really decided we wanted to do as little maintenance as possible since Kevin is still spending seven days a week at Experimac (come check us out!) and Colette is working late every day and occasionally on weekends too. About the same time we made this decision another RIB magically appeared in the marina, owned by our friend Mike. Seems like he had the same idea. He went cheaper, in fact his brand new RIB total investment was under $1000 with motor! We decided we wanted something a bit more comfortable than his 10'6" model and purchased a 12'9" BRIS inflatable with aluminum floor and seats. Scouring Craigslist for a few weeks turned up a 1960 Johnson 10HP outboard motor which fit with some minor modification and finagling on the transom. The RIB is awesome. It may be the best investment we've made in a long time. We had to register it with the state and purchase a few doodads for cruising but our total investment is about $2000. We purchased high quality Norwegian navigation lights for touring at night, a fire extinguisher, drybag and sealable storage bin to hold essentials, a pack of PFDs, a couple throwable pads for seating, and we use it a lot. It came with oars so Kevin has even used them to get some upper body workouts on the river - paddle down to Chinatown and motor back up. 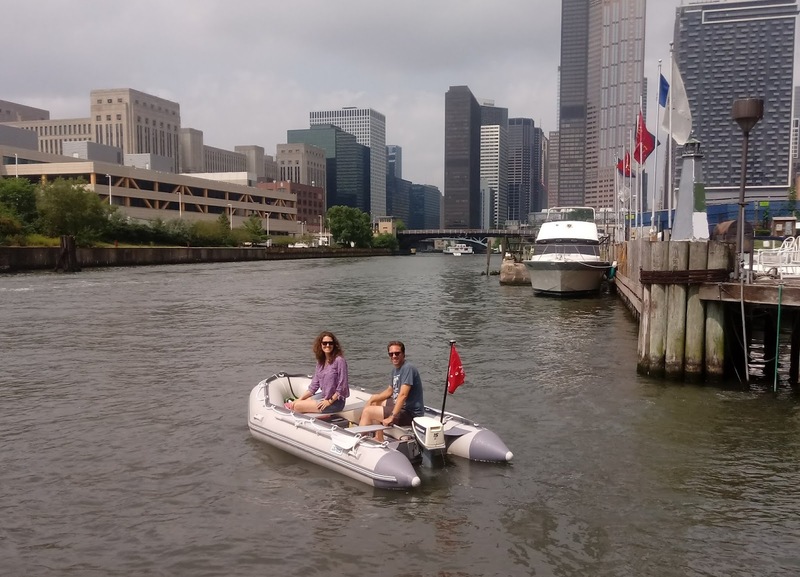 We've done bar crawls on the river, gone shopping at West Marine, REI, and Whole Foods, taken it up the North Branch for brunch, and just spent time cruising. We love it. Full disclosure however, the outboard motor started out great but began having problems after a month of use. It wouldn't stay in forward gear, it just pops out. Recently with the help of Mike we pulled it off and inspected it. Gear oil was good but we noticed an engine mount that has a crack. This crack isn't detrimental to the engine but the piece does seem to have some relationship with the shifter. We sourced another part from Ebay for $10 and replaced it but it didn't help. So again with the help of Mike we took the thing for a ride in the trunk to a remote location and.... traded it for a 15HP Evinrude from 1984. The new motor is much quieter, much more powerful, smaller in stature, and much more fuel efficient. It has no problem getting our RIB up on plane and hitting 15-18 miles per hour. We have been having a bit of an issue with the low speed cruising but Kevin thinks the gas mixture is too oily. The Johnson was run at 24:1 fuel to oil in the old two-stroke but the Evinrude should be run at 50:1 and we are still burning through the richer mixture. If you don't know what any of that means don't worry, it doesn't really matter, but know that the minor issue we've been having should be fixed the next time we fill up with fuel. A powerful little motor, it really moves! So, water we thinking about our new bundle of joy? We love it and plan to spend a lot of time aboard. Cygnet is still our first love, but we're very happy to have an alternative to taking Cygnet out when we want some water time. Tune in next time to hear the story of how Chicago Ribber was stolen! Headed for Saturday brunch and a little grocery shopping by RIB. Just the right size for two and able to take a couple more. A comfy seat on the river. So enjoy your LOTW (life on the water) stories. Looking forward to meeting Chicago Ribber. It certainly sounds like a bow thruster, and maybe a stern thruster, would be a good investment. Alternatively, you could find a different marina. My own plan is to anchor out most of the time. Presently, my 50 foot unfinished S/V catamaran bobs with my cats and I just north of NYC. 5 years of (mostly alone) work, and my own design is still not done. Pretty cold in here, if I turn off the propane heater.